Introducing Kate to solid foods was probably the first thing that really had me rattled as a parent. We waited until Kate was 6 months old before she had her first “solid” (super soupy rice cereal) and after that I had no clue what to do! Should we start with veggies? Fruits? Which ones? How much? And how in the world do you prepare these things?? My next step was to ask my friend Jill to come with me to our local grocery co-op and teach me how to shop the produce section. If you haven’t already picked up on it, my point is this: If I can make baby food from scratch, anyone can. Prior to diving into this little project, I couldn’t tell a lime from an avocado from a mango. I’m the girl that asked the produce guy at Whole Foods to help me find a butternut squash…in the middle of summer. (He laughed at me.) I had to YouTube how to cut an avocado, for crying out loud! Since that time I’ve learned a lot about how to prepare wholesome, nutritious foods for Kate, and my biggest resource–especially when it came to learning about homemade purees–was WholesomeBabyFood.com. This website covers a wide variety of topics such as Is Your Baby Ready for Solid Food?, How Much Food Should My Baby Eat?, food allergies, forbidden baby foods, how to puree and store, and my favorite–food charts based on age, and recipes based on stages. I know it can seem incredibly overwhelming at first–especially if you’re starting out with as little knowledge of how to prepare fruits and vegetables as I had!–so I’m going to share how I generally tackled things. First, I started with the Wholesome Baby Food age-based food charts. Keep in mind these age ranges are just general guidelines that you should adjust as needed based on your child. For example, we waited until Kate was 6 months old to start her on her first solids, but we still used the “4-6 Month Chart” as our guide (versus the 6-8 Month Chart) because that was the stage we were in. It’s also very important to consult with your child’s pediatrician about introducing new foods for your baby. This post (and the website I’m referencing) are not meant to be substitutions for your pediatrician’s recommendations and your own research and judgement of what’s best for your child. After referencing the appropriate food chart, I chose one food item that I was going to introduce to Kate, and I did my research on how to select, store, and prepare that item. Working with one food item at a time helped me feel less overwhelmed and also slowed down the urgency I felt to introduce Kate to everything and get my freezer stocked with 20 different purees. Remember, this is not a race–it’s okay to take your time. The “4 day wait rule” also helps because it forces you to slow things down and not rush the process. 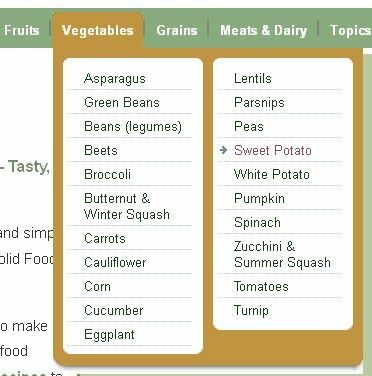 This brings you to the Sweet Potato page, which covers pretty much everything you could ever want to know about sweet potatoes–their nutritional value, how to properly select and store them, the best ways to cook them for baby food, and of course, lots of related baby food recipes! Every couple of days I choose a new food item to make for Kate until we had worked our way through the food charts and I had a freezer full of nutritious goodness! One last bit of advice–don’t go too overboard on stocking your freezer with purees for your little one because you never know how long they’ll be at that stage. Once we introduced Kate to finger foods she no longer had an interest in her purees, so she was really only in that stage for about two months. Luckily I was able to get creative and incorporate my stockpile of purees into finger food recipes, but if I knew then what I know now I could’ve saved myself a lot of time! We just started on solids 2 weeks ago,m a week before my daughter turned 6 months. So far we’ve done bananas, sweet potatoes, and green beans… wow, what a face she made at those green beans! I’m making all of Lily’s baby food too, and I love wholesomefeeds.com. Thank you so much for sharing this website! Ive had so many questions for a while about foods-great resource! Thank you so much!! My daughter is just about 4 months old, but I have started to stress about starting solids at 6 months. This has helped so much! I just saved that page to my favorites! How did you store the purees? Wow! Very interesting and thorough. But the pediatrician who runs the practice we go to (and wrote a book on baby care) said we can just give our baby whatever we’re eating, mashed up (we have no history of food allergies). I think that appeals to the lazy in me. I don’t think I’ve commented much, but I love reading your blog. This post is very helpful as I’m just starting to read up on solids. We plan to wait until our girl is 6 months too. Thanks! This was the perfect time for me to read this post! My little guy is 5 months old so I’ve started researching making baby food. It’s always nice to hear from a real person! I never tried making baby food with my first child but when I tried it with my second I was surprised at how easy it was! We LOVE this site. So helpful! And great recipes I think even I might enjoy! That’s funny story in wholefoods but I thought you were raised on a farm and did a lot of cooking. @Carey–I used WholesomeBabyFood.com as my guide for introducing finger foods as well. You can find the finger food links in their navigation menu at the top of the page. It’s a great resource to get you started! @Mellissa–I froze the purees in ice cube trays for about 24 hours and then I popped them out and tossed them in Ziploc freezer bags for longer-term storage. @Aries–Impressive observation! Yep, you’re right, I did grow up on a farm and did a lot of cooking, but sadly my produce knowledge was still extremely limited. We grew some very basic fruits and veggies (tomatoes, cucumbers, potatoes, lettuce, beans) but never ventured far from the basics. My family also never purchased fresh fruits or vegetables from the grocery store, opting instead for cheaper “inside aisle” options like pasta and rice. B/c of this I felt sort of programmed to avoid the produce section because it had always intimidated me. As for cooking, our family’s meals were primarily meats and starches–not a whole lot of fruits and veggies on our plates growing up, sad to say, so trying to introduce these foods to my family is a whole new world to me. Hope that clears things up!